In theory, we were to transfer to Annapurna N base camp by helicopter the following day, 9th May, but cloud cover was too heavy and the Kathmandu valley was shrouded in rain. The trekking route to the original base camp used by the French first ascent team in 1950 is now so dangerous for porters that all expeditions now fly into this camp. The next day was little better and Felix and Adam descended to Jomsom leaving Rick with the sirdar at base camp. As luck would have it, the following day was perfect for flying and Rick guided the little red and white helicopter into land shortly after 7.30. Meanwhile, in Jomsom, Adam and Felix recognised at once the sound of the helicopter and hurried across to the helipad. ‘Have you seen a red helicopter?’ they asked. An official tried to check their documents (they had none) while they insisted all the more strongly they needed to be on the red helicopter when it landed. Meanwhile, the red helicopter had transferred all of the expedition’s baggage to Annapurna and was taking Rick and Ram to the new base camp. Other members in Jomsom, the pilot was told. Satellite SMS messages were exchanged and the pilot agreed to pick them up. An hour later, the team was re-united under the shadow of Annapurna and a fourth flight delivered fresh food and equipment. We were finally in place. We were sharing the open slopes above the North Annaupurna glacier with small Italian, Spanish and Chilean teams who were all on the mountain, pushing for the summit via the 1950 French route. 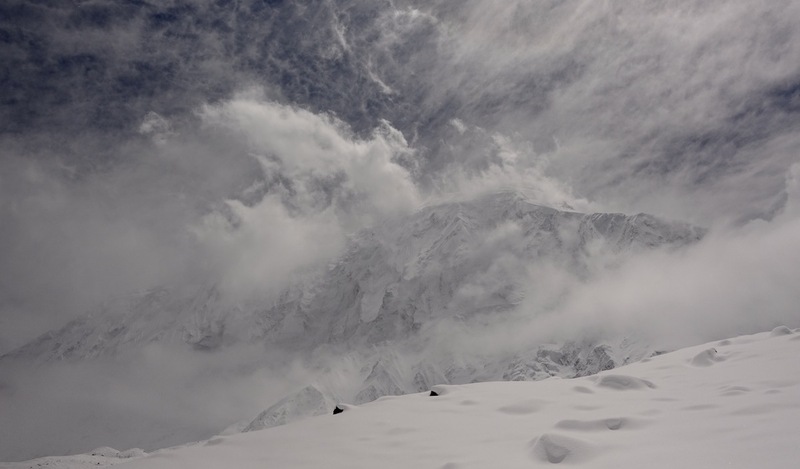 This period of low wind enabled the established teams to complete their ascents while the new arrivals could only look at the longer term forecast of strong (90kph) summit winds in frustration. 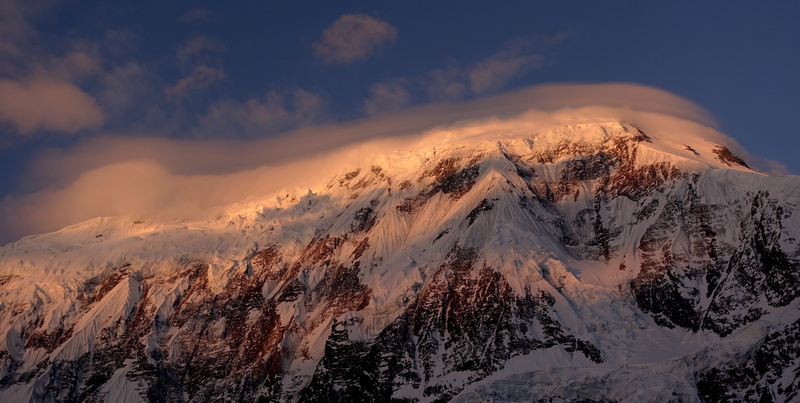 When the successful pairs descended, their tales of avalanche risk and serac collapse confirmed the dangers associated with the classic route and re-affirmed our team’s choice of Tilicho Peak for acclimatisation. With our team in place and acclimatised, our chances hang on the weather in the final weeks of the pre-monsoon season. Our chosen route beckons; extremely challenging yet feasible. There will be difficult choices for us as the available window closes and we await a break in the high winds. Wow.Good luck for Annapurna, passt auf euch auf!